COLUMBUS — Gov. John Kasich continues to campaign around the country claiming to be a “moderate” and “compassionate” Republican, at the same time that his administration moves to implement a plan that will kick hundreds of thousands of Ohioans off of their current health coverage. Gov. 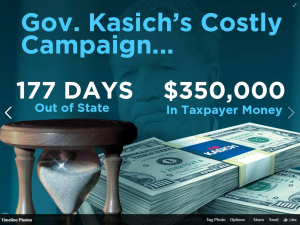 John Kasich has spent more than 177 days out of state — that’s a figure from last month, it’s certainly gone up since then — and he’s spent more than $350,000 of Ohioans’ tax dollars on security for out-of-state travel to bolster his failing presidential run.